As mentioned in the previous post, one of the Sensenich provided mounting bolts to be used for mounting the propeller’s inner hub to the propeller flange on the Rotax ULS engine was the wrong size. Friday the correct propeller bolt was received from Van’s and immediately taken to the hanger to be put to use installing the Sensenich propeller onto the DOG Aviation RV-12. Armed with the correct bolt, it’s time to begin instillation of the Sensenich propeller. The RV-12 utilizes a Sensenich 2A0R5/R70E Rev. F two blade, composite, adjustable pitch (only ground adjustable, not during flight) propeller. The root of each composite blade has a round flange that seats into recesses in the inner and outer hubs and become sandwiched between the hubs. While the hub bolts are loose, the propeller blades can be twisted independently of one another to obtain the desired propeller pitch. There is a pitch gauge provided with the propeller that slips into holes in the forward hub so the blade can be twisted until a pin touches the gauge … but Van’s now suggests using the Sensenich gauge as a starting point during assembly and setting the final pitch using a digital level with a Van’s provided tool that slips onto the edge of the propeller. The Sensenich 2AOR5/R70E two blade, composite, ground adjustable propeller blades. To begin the instillation, the inner hub needs to be bolted onto the propeller flange on the Rotax 912 ULS engine along with the S-1202 spinner plate. The hub instillation is easy … six bolts, six nuts and six bushings and twelve NordLock washers are used to mate the inner hub and S-1202 spinner plate onto the flange on the Rotax engine. Double sets of NordLock washers are used … one under the head of the AN5-15A bolt and another on the backside of the flange bushings under the lock nut. Once a bolt is inserted through the propeller flange on the engine, a flanged bushings are inserted from the aft side of the propeller flange on the engine and slid into recesses on the aft side of the propeller hub. Once the propeller’s hub and S-1202 spinner plate are in place the bolts are torqued to 18-20 foot pounds. Propeller’s inner hub and S-1202 spinner plate attached onto the engine’s propeller flange. The bolt and NordLock washer in my right hand is inserted from the front of the propeller hub. The flange bushing, NordLock washer and lock nut in my left hand go on the aft side of the propeller flange on the engine … the flange bushing are inserted through holes on the propeller flange and slide into recesses in the propeller’s hub … NordLock washers and lock nuts hold it all together. Installing the propeller’s separate blades, outer hub, Van’s S-1208 spacers and S-1203-1 front spinner bulkhead is a hand full of parts for one person to juggle at one time so I gave Bernie a call for 5 minutes of assistance …fortunately Bernie was out running errands on his motorcycle and not too far from the airport. The order of assembly begins with placing both propeller blades in the recesses on the inner hub. Next an AN5-24A bolt with a NordLock washer is placed through the S-1203-1 front spinner bulkhead then the S-1208 spacer is slid over the shaft of the bolt and the bolt is inserted into the propeller’s outer hub. The easiest way to assemble all the parts is to first insert all the bolts with NordLock washers through the S-1203-1 front spinner then slide on all the S-1208 spacers so the parts can be mated to the prop hub as one assembly. While the propeller blades are being held in position, the outer propeller hub is placed over the blades. With one person holding the outer hub in position over the two propeller blades, the other person brings the previously assembled parts in position and inserts the bolts into the outer hub and threads the bolts into the inner hub. With Bernie’s assistance holding one of the propeller’s blades, and firmly pressing the outer hub against the two blades, the parts were installed without mishap. Because the propeller blades are composite and hollow, the blades are quite light for their size so there was no fighting necessary to keep them in position. Bernie positioning one of the propeller blades to fit into the recess in the inner hub. Of note: The pin that is used with the aforementioned Sensenich pitch tool is visible just above the pitot tube protruding from the propeller blade’s round root. Prior to torqueing the bolts for the propeller, there is a procedure in the new version of the instructions that instructs the builder use a digital level to set the pitch of each propeller blade. The process begins with leveling the propeller by setting blocks of wood on the flat spots on the hubs and spanning the wood with the level and adjusting the prop position for level. Because the center of the propeller hubs are rounded, two blocks of wood are used to elevate the digital level to clear the round center of the prop hubs so the blades can be leveled. The blades are positioned at level. After leveling the propeller blades, the digital level is to be placed on the canopy rail and zeroed making the canopy rail a reference point … this is done so the propeller can be removed for inspections and installed back to its original position or for making pitch adjustments that are consistent and repeatable . After zeroing the level to the canopy deck, without turning the level off it is to be placed on a Van’s provided metal tool appropriately named TOOL-00002. The TOOL-00002 is hung from the propeller and the digital scale is placed up against the tool to read the pitch angle. According to the instructions, an initial pitch of 71.4 degrees is to be achieved which should get the propeller in the ball park for the initial engine start. Later, prior to the first flight, the pitch may need to be adjusted if the engine’s maximum ground RPM does not fall into a desired range. Of course, at DOG Aviation there has been a steady diet of modifications … so modifying the TOOL-00002 prop tool to make it more user friendly seemed to be the thing to do. Before Van’s began including the TOOL-00002 adjustment tool with RV-12 powerplant kits, builders were making their own fixtures for digital levels so accurate propeller pitch adjustments could be made. One digital level was suggested because it has a 1/4-20 threaded hole in the bottom of the level for a tripod mount making it easy to attach to a fixture for measuring the angles of the propeller’s blades. At the beginning of the RV-12 project the DOG Aviation procurement department purchased one of the levels. Unfortunately, the Van’s tool did not have mounting a hole for the digital level so after checking clearances, decided to drill a hole in the TOOL-00002 prop tool so the digital level could be attached directly to the tool using a 1/4" bolt. Admittedly, I’m not too thrilled with the Van’s tool compared to some I have seen other builders make … but it does work. A single 1/4" hole was drilled into the TOOL-00002 pitch tool so a digital level can be attached to the pitch tool without relying on the anemic magnets on the bottom of the level. Return from the future: The position of the level in the above photo is incorrect. Nick a fellow builder caught this error. The blade should be pitched so the level leans to the left and NOT to the right as in this photo. The TOOL-00002 with digital level attached sitting on a propeller blade ready to be used to fine tune the propeller blade’s pitch. Using the fixture in the above photo each propeller blade was adjusted to 71.4 degrees after the level was zeroed to the canopy deck. I found as the bolts were tightened, the settings changed a bit because the bolts were left a little to lose initially. After snugging up the propeller bolts a little but leaving them lose enough to be able to move the blades with two hands, the pitch was adjusted again. This time as the bolts were cinched down the pitch did not move. The propeller bolts were torqued in three stages to a final torque of 19 foot pounds. After adjusting the pitch for each blade to 71.4 degrees (using the canopy deck as a zero reference) the six AN5-24A bolts were tightened in three steps to a final torque of 19 foot pounds. Completed instillation of the Sensenich 2AOR5/R70E two blade, composite, ground adjustable propeller on the DOG Aviation RV-12. Need to attach the spinner next. Return from the future: The euphoria was short lived. 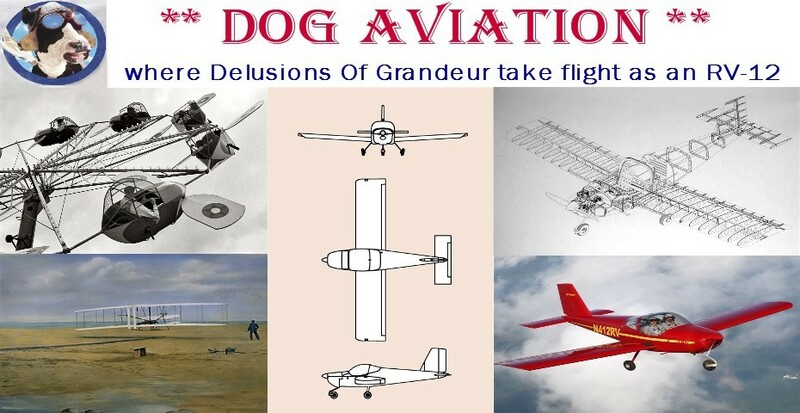 Fellow builders reading the DOG Aviation Blog take heed …. There is no point in setting the final pitch or torqueing the propeller bolts until after the spinner is completed, because the propeller blades MUST come off to complete the spinner instillation as I just found out reading ahead. My bad, I missed that in the last sentence in 47-05 step 5 of the plans during the initial reading. Drilling the holes for the spinner's nutplates needs to be done from inside the flanges on the S-1202 and S-1203-1 spinner bulkheads.